What do Ayusa exchange students take home with them after their exchange year? It is more than a collection of memories. It is something that drives them to make a difference! Tamba came to the U.S. from Sierra Leon for the 2013-2014 program year. During his time as an Ayusa YES student, Tamba learned how to use a computer for the first time, attended the Civic Education Workshop in Washington D.C., and was even our Star Student one month! Through all of wonderful experiences, Tamba began to think about all of the ways he could help his community once he returned home. After having learned so much in such a short time, Tamba concluded that the single most important thing he could do was encourage education. With that goal, he set out to create a scholarship program to help the students of Gbukuma Village pay for their school fees. With the help of his old host community in Colorado, Tamba was able to raise $700 for his cause! Tamba knows that it is a long road ahead, but he is already actively working to increase the scholarship to help as many people as he can. In the past week, his scholarship handed out uniforms and school supplies for students ready to learn. While he had hope before he became an exchange student, he has now taken action. 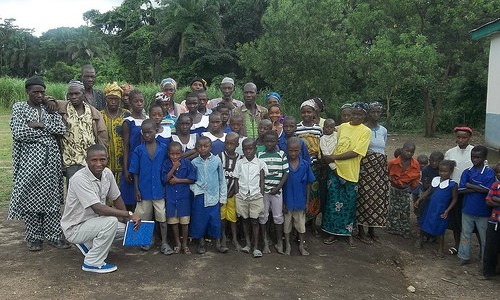 Tamba is making a difference in not only his community, but in the world. That is what he took back with him.